I will try to make this one as short and sweet as possible. (try) It is going to involve some double-dipping with the AA shopping portal. That is an acronym for ‘buy one laptop get one flight free’. As dumb as it is, this deal is no joke. American Airlines’ shopping portal is throwing in a bonus 4,000 miles for spending over $1,200 via the portal. The terms state that gift card purchases don’t count towards the 4,000 bonus miles but I can confirm that Raise.com, a gift card reseller, IS TRACKING. Yes!!! I am going to show you how to get a one-way domestic flight on American Airlines for free and save 12% on your laptop/desktop purchase. We are going to buy HP gift cards from Raise.com. They have many $100 gift cards listed at a 12% discount off face value. That means even after taxes you’ll still be saving money off of the sales price, yay! If you don’t already have a Raise.com account, you can create one here with my referral link. We both get $5. Raise typically delivers the e-gift cards within minutes of purchase. Now that you are logged into your Raise.com account, close that tab and click this AA shopping portal link. Sign into your AA account and then click the blue ‘shop now’ button. AA will take you to Raise.com where you can purchase your HP gift cards. The laptop that I am using for this example is $769 (don’t purchase without continuing the other steps below). That means you will purchase at least $800 in gift cards to cover the laptop plus purchase plus tax. Okay, Raise is earning 2x AA miles now, $800 in gift cards will earn you 1,600 AA miles. Your cost of the gift cards will be around $700. Me likey. Time to buy this bad boy. HP is earning 10x miles through AA shopping portal TODAY only. That is a lot of miles for a merchant that sells high-ticket items. Checkout and apply the gift cards. Make sure you are not using a proxy as HP looks for US based IP addresses during this process. Time to count the loot. Assuming you bought this OMEN gaming laptop, here is how you did. The sweet part is that you are saving huge on the laptop, your shipped cost after tax would be about $750. That is a really good deal on this laptop with dedicated graphics. Spending your miles. Most people value AA miles at roughly 1.3 cents per point. That would make your return worth around $180. Not bad considering you are saving 12% on a SALE laptop in addition to the miles. You can fly on American Airlines or Alaska Airlines for 12,500 miles one-way in the lower 48. You will need to find low-level sAAver space and pay $5.60 in fees. Keep in mind, unless you have status with American you will have to pay a $75 close-in fee if you book a flight within 21 days of departure. 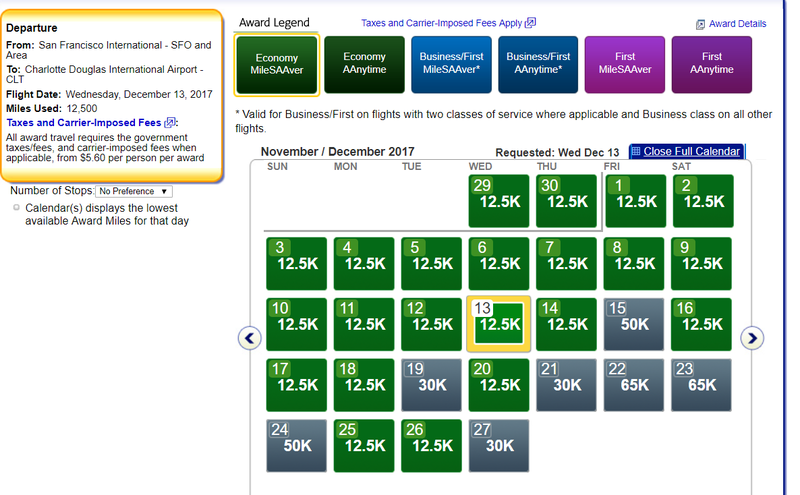 In this example you’d need to redeem 12,500 AA miles for a flight that costs $210. That is almost 1.7 cents per mile, pretty decent for a domestic award. If you are in Europe, you can fly one-way for only 12,500 AA miles in economy. You can book using Oneworld partners like British Airways, Iberia, and Finnair. This flight from Madrid to Helsinki requires only 12,500 AA miles and $23. The cash price of this same ticket is $249, that is the lowest I could find non-stop. That is a great redemption for a four hour flight.